Mule skinners must abide by federal law and apply for Transportation Worker Identification Credentials, TSA says. The requirement has officials of the Hugh Moore Historical Park perplexed. "We have one boat. It's pulled by two mules. On a good day they might go 2 miles per hour," said Sarah B. Hays, the park's director of operations. In December, Hayes wrote to Rep. Charles Dent, R-Pennsylvania, about the requirement. Dent, in turn, wrote to the TSA requesting a waiver, noting the mode of transportation involved was "mule-drawn canal boats." In January, the TSA responded, noting the Maritime Transportation Security Act of 2002 applies to all mariners holding U.S. Coast Guard-issued credentials. "We encourage the crew members... who possess Coast Guard mariner credentials to obtain a TWIC at their earliest convenience to comply with these requirements and not risk suspension or revocation of their other credentials," the TSA wrote. On Wednesday, the mule skinner debate reached Capitol Hill, when Dent asked new Homeland Security Secretary Janet Napolitano about the necessity of conducting background checks on mule drivers. 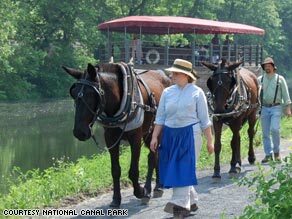 He displayed a photo of two mules, Hank and George, tugging a canal boat in the company of two park employee mule drivers in colonial working attire. "Now Hank and George, while sometimes are ornery, they are not terrorists," Dent said. Napolitano said she would try to be flexible. "Obviously this is a picture designed to say 'Hey, isn't it absurd that they be required to have TWIC cards.'" Napolitano said. "Um, let's work with you on this particular case, if we might." Park officials say four or five park employees typically have Coast Guard credentials to operate the canal boat, and the extra expense of a TWIC card, which is at least an extra $100 on top of fees for Coast Guard credentials, is unwelcome. "I think the rule was written and the policy was set up for all the big shipping, and they never even considered something outside the normal bounds," Hays said. Dent said he will work on a "common sense" solution with Napolitano.